Thriller In turn-of-the-century London, aspiring magicians Robert Angier and Alfred Borden learn their craft under the renowned illusionist Milton. The two men are plants in the audience at every show, who aid Milton in the spectacular final illusion by binding the hands and feet of pretty assistant Julia - who is also Angier's sweetheart - before she is dropped into a tank of water, apparently to drown. When the trick goes tragically wrong, supposedly the result of Borden tying the wrong knot, Angier and Borden become sworn enemies, determined to out-do one another by performing increasingly dangerous tricks. 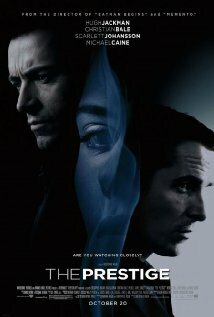 The Prestige is not currently showing anywhere.